As one of the leading manufacturers of home and business phone systems, Panasonic is always at the cutting edge of technology and innovation. In this Panasonic KX-TG4742B review we will provide you with information about the most important features that should be considered before making a decision on which model to buy. The wireless technology used in this model is DECT 6.0 Plus, which is a telecoms standard widely used around the world. With years of refinement this technology allows for incredibly clear audio quality and a range that will pretty much satisfy the average user. Bear in mind that the range will be dictated by environmental factors as well as the build quality of the phone. 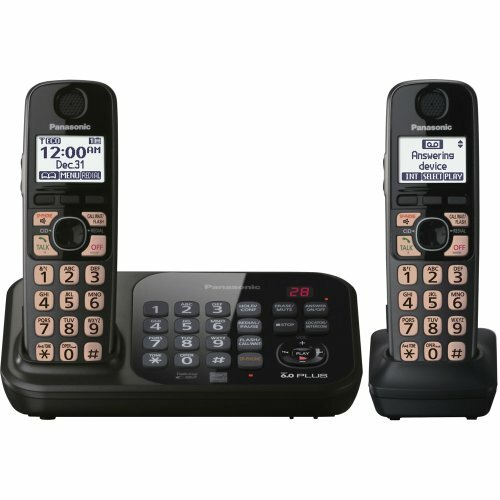 Expandable up to 6 handsets, the KX-TG4742B will ship with 2 handsets included. One of which will be chargeable on the base unit, while the second one can be located anywhere within range of the base unit. If you know that you require more than 2 handsets then you can select the number you need directly on the Amazon.com page. This will of course add to the cost. Being able to expand to 6 handsets is a great feature and for most home user and small businesses this will be quite adequate. It also means that you can add handsets as your needs increase, for example, as children grow older you might want to add additional devices. If used in a small business you can keep your initial costs down and only purchase additional units as the need arises. In my opinion an answering machine is a very important feature to have. We have gotten so used to voice mail on our cell phones that it has just become a must have for home phones as well. Especially for businesses though, this is a critical function, as you do not want to miss a potential customer because you were unable to get to the phone. With the Panasonic KX-TG4742B all the handsets flash when a message is waiting and the messages can be checked from any handset or the base unit itself. The recording time is about 18 minutes which is plenty for most people’s needs. In addition, you can access your answering machine remotely which is a great way to stay on top of you messages when you are away for a few days. As part of this Panasonic KX-TG4742B review we have to highlight this very innovative feature. Not only does each handset display the stored name of incoming calls, the system also uses text-to-voice technology to speak out the name of the person calling. Between each ring of the phone you will hear the name of the caller, and you can decide whether you want to answer the phone without having to find it. This Panasonic KX-TG4742B review is very positive on the device and the expandability. Functionally it is very rich and the phones are easy to set up and use. The only feature missing is Bluetooth, but this would cost more and is available in other models reviewed on this site.